The D.W. Fearn VT-1 and VT-2 tube preamps, Vt-4 tube program equalizer, and VT-7 tube compressor-limiter are the finest contemporary tube circuit audio products available to recording studios, engineers, producers and performers. The D.W. Fearn philosophy and discerning hand build quality will provide you with the best signal delivery devices necessary to achieve optimum recordings [and make your customers happy!]. The VT-1, VT-2 preamps exhibit warmth, sparkle, and responsiveness to draw engaging performances. They are great for delivering the inherent signature sound of vintage vacuum tube and FET condenser microphones, as well as enhancing the sound of dynamic and ribbon microphones. Excellent frequency sculpting and enhancement, beautiful spectral tailoring is derived from the D.W. Fearn VT-4 tube equalizer. The VT-5 is the detent switch type setting "stereo mastering version of the VT-4". Both the VT-4 and VT-5 feature LC-type filtering, as found in the vintage circuits of the Pultec EQP1A series. LC-type filters are the highest quality method of achieving critical equalizer filter performance. The D.W. Fearn VT-7 dual channel tube compressor is great for everything from tracking to final mixes, also fantastic as a great vacuum tube circuit audio enhancement pass through interface. 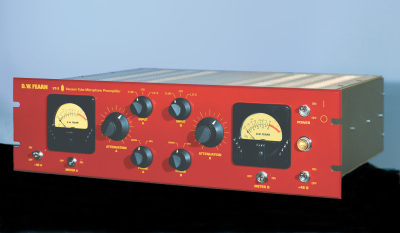 The D.W. Fearn VT-24 4-channel tube preamp gives the studio owner and live sound engineer ability to have the D.W. Fearn multiple tube preamp sound with high rack space efficiency. If you need interfacing tools with the best tonal character, choose the D.W. Fearn PDB passive direct box, D.W. Fearn LP-1 line level to mic level pad box, and VT-3 tube direct box for the best results. Call Vintage Loop for details @ 586-786-1767. We have responsive access to all of these products and are a long time, reputable D.W. Fearn dealer.